I was provided the above mentioned products in order to provide an honest review. What do you put in your little girl's stocking for Christmas? How about a DVD of one of her favorite characters, Angelina Ballerina. 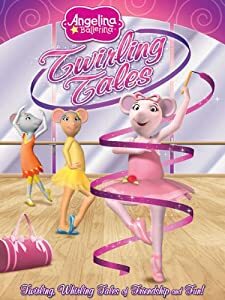 Angelina Ballerina: Twirling Tales was recently released on DVD, Digital Download and Video on Demand from Lionsgate and HIT Entertainment. Angelina and her friends take center stage for friendship, fun, and imagination. Angelia Ballerina loves to dance and perform all while inspiring little girls to achieve their dreams. Angelina shares lessons in friendship, loyalty, and of course fun while dancing into the hearts of little girls everywhere. In Angelina Ballerina: Twirling Tales Angelia and her friends are on their toes in some twirling, whirling tales of friendship and fun. Angelina and her friends must dance like a cake for Vicky's cake themed dance day. Angelina and her friends must figure out how to fit their favorite music and dance into one grand finale for the big Spring Fling. And Angelina's parents get involved with their very own dance moves too. Angelina Ballerina is able to put a smile on any little girls face. My twin nieces love dancing around when Angelina Ballerina is on. I really like how they pair the learning process with lots of fun. I'd like this for my daughter because she loves ballet. For my daughter. She loves Angelina Ballerina and would be thrilled to get this! Visited Haba. I love the Caterpillar Dice Mini Tin Game! Haba games are great! I would love this for my niece since she loves angelina! My granddaughter would love to dance around with Angelina. for my daughter she loves angelina and so does my sister. i like the Magica Clutching Toy. I would love this for my daughter since she loves Angelina. I like the Aquini Girl - 13 inch Doll, 6 Piece Set, No Hair - Gotz. I'd like to win for my 3 youngest children who are fans of the show. My twin nieces because Angelina is a great story! Love her! I would love this for my youngest daughters children. They love hearing Bible stories, and this would let them hear the stories, even if I am not there to read them! From HABA, the Gotz 18 inch dolls are amazing. I love the Jessica doll, and I know my granddaughter would too. I want it for my family! I want it for my niece. She takes dance classes and loves anything to do with dance.